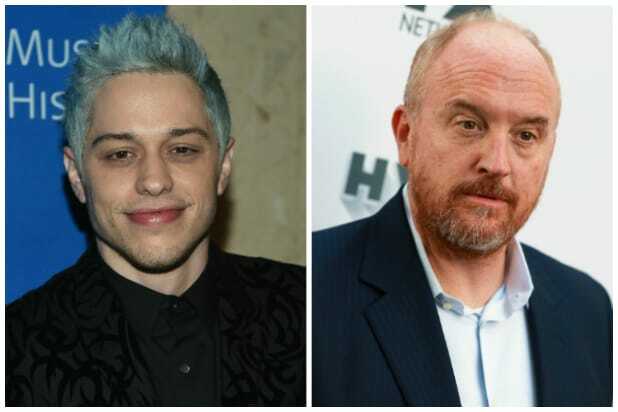 Pete Davidson jumped back on stage on New Year’s Eve, when the “SNL” cast member got out some gripes about fellow headline-making comic Louis CK. Davidson told the Chevalier Theatre crowd in Medford, Massachusetts, on Monday that when CK hosted “Saturday Night Live” in April 2017, which was Pete’s freshman season on the sketch-comedy show, the “Louie” star “told all the producers in front of me that all this kid does is smoke weed and he’s gonna smoke his career away,” according to an Us Weekly recap of the set. The spring performance was CK’s fourth turn hosting the long-running NBC show — and his tattling didn’t stop there, per Davidson. CK then told “SNL” executive producer Lorne Michaels “that Pete smokes so much weed that it makes people uncomfortable,” per the celebrity magazine’s writeup. “This motherf—er’s been locking doors and jerking off in front of people,” Davidson added, referring to the sexual misconduct accusations against CK. The 51-year-old has admitted that the allegations against him are true. That wasn’t the only harsh CK punchline of Davidson’s Boston-area performance. The next one utilized comedy’s famous rule of three.